I see London, I see France, I see everyone's underpants! The annual #NPSR, started by New York City's Improv Everywhere, has been growing since 2002 and has taken place in Toronto for a number of years. 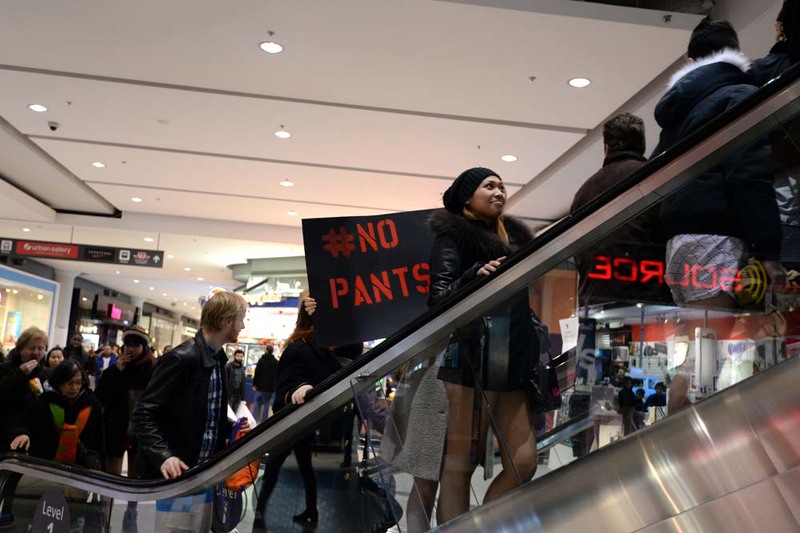 This year the event was also promoted by the No Pants Society Social Club, offering a combo subway ride and dance party starting at 3 pm on Sunday, January 11, 2015. "The No Pants Subway Ride is an annual event staged by Improv Everywhere every January in New York City. The mission started as a small prank with seven guys and has grown into an international celebration of silliness, with dozens of cities around the world participating each year. The idea behind No Pants is simple: Random passengers board a subway car at separate stops in the middle of winter without pants. The participants behave as if they do not know each other, and they all wear winter coats, hats, scarves, and gloves. The only unusual thing is their lack of pants." 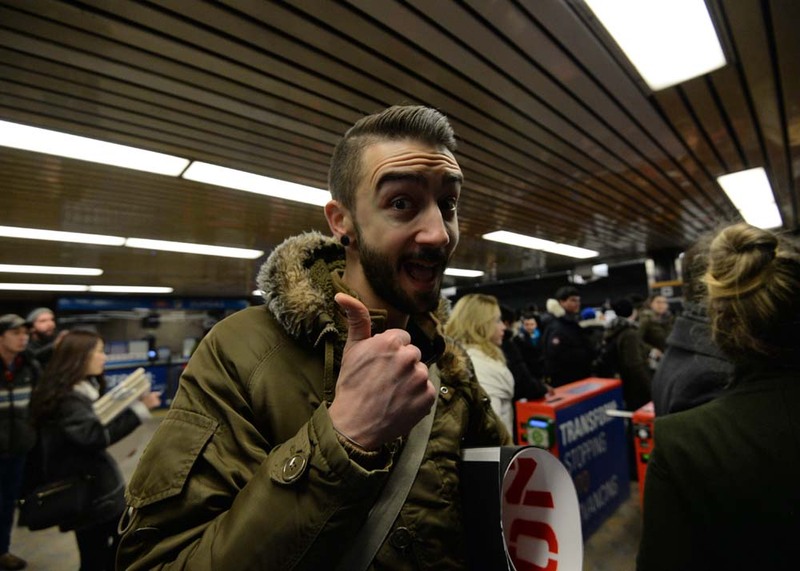 In Toronto participants gathered at Lawrence Station, the Eaton Centre at Yonge and Dundas or at The Eaton Centre Queen Street. 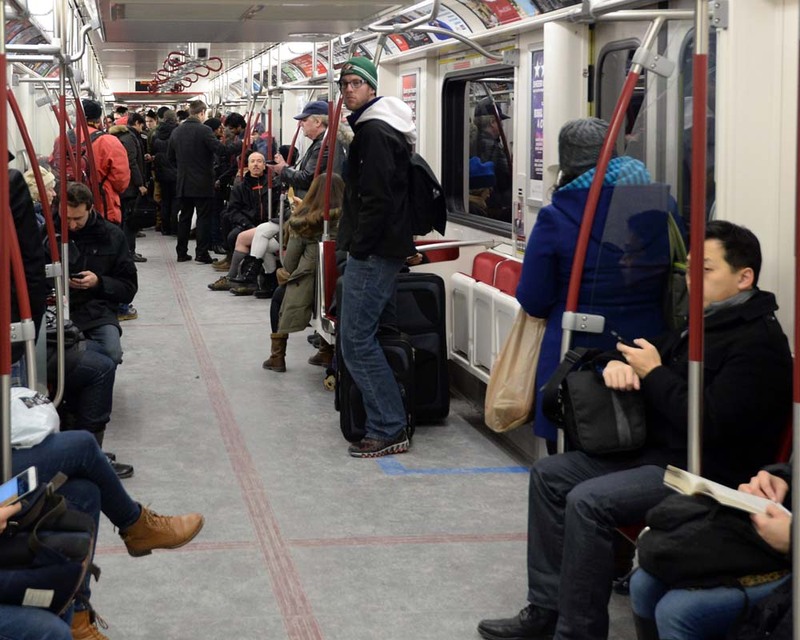 Then the pantless horde entered the TTC subway tunnels where the kept to the new subway cars and traveled back and forth on the Yonge line between Finch and Union Stations. Finally, after a day of quirky fun in the underground tubes, a parade along Queen Street began around 5:30 pm with the Office Pub on John street as the no pants after party destination.